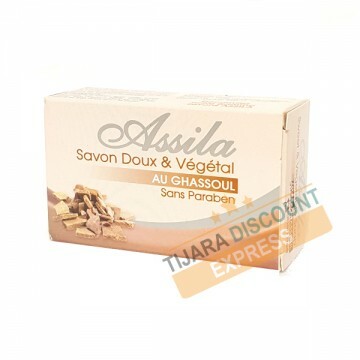 The soap RHASSOUL absorbs impurities and fats as a blotter, they then remove rinsing. It moisturizes, revitalizes and softens the skin and protects against drying out. It Reduces chapping and cracking caused by cold winters. It cleans acne skin, suitable for skins elasticity of losses. It is lightly scented with the perfume of rose oil.